Currently offering seven different categories of various bicycles, Schwinn is one of the top rated bicycle manufacturing companies in the entire world. Founded in Chicago, Illinois in 1895, Adolf Arnold and Ignaz Schwinn established a partnership that would soon lead to some of the most profound creations in cycling history. Although the company has evolved and progressed significantly over the last 100 years, they are now operational under the blanket Dorel Corporation. 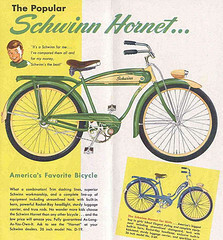 Schwinn specializes in a myriad of different bicycle styles ranging from professional racing bikes to tyke-sized tricycles. Shoppers can peruse through their vast collection of cruiser bikes, urban riders, bikes styled for path riding, and hybrid styles that include a combination of unique features. Cruiser bikes – Schwinn offers an array of traditional cruising styled bikes that are perfect for laid back riding. The frames of these bikes are classic and sophisticated, and their mechanics make them ideal for beach or street cruising. Beach cruiser bicycles are also available in a tandem style (so does Electra bikes), allowing two riders to operate the bike together. Schwinn’s road bicycles are designed for performance and speed. They are targeted for experienced riders who prefer long distance, endurance riding. With lightweight frames and top of the line logistics, a Schwinn road bike is perfect for long-range adventures. Schwinn’s Urban inspired line of bicycles features stylish sophistication combined with efficient functionality. This category features a variety of different frames that are specifically designed for aesthetics and durability. Urban bicycles are ideal for commuting and busy city life. Hybrid bicycles are a unique combination of various features. Users who ride their bicycle in a variety of different environments will appreciate the versatility and comfort of a hybrid both on the road or all terrain path. Hybrids may be used for casual riding as well as for fitness purposes. Schwinn also offers a wide variety of bicycles that are specifically designed for the fluctuations and intermittent terrain styles of off road mountains and trails. With unsurpassed durability and exceptional quality, these bikes are constructed for rugged adventures. Regardless of age, size, or experience level, Schwinn has a bicycle to fit any lifestyle or activity level. With pristine attention to detail, high quality materials, and flair for style, Schwinn’s products are certainly worldwide favorites and could be yours too!